We offer the best cone bottom tanks. All of our plastic cone bottom tanks are made with FDA approved UV Stabilized plastic. We offer our cone bottom tanks in 1.5, 1.7 or 1.9 specific gravity. 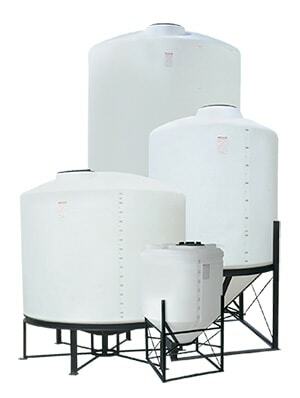 Our cone bottom tanks are used commonly for the storage of liquids when complete drainage is necessary. All of our cone bottom tanks come with built in gallon indicators, a lid/manway, and a drain fitting. All of our cone bottom tanks are offered with a support stand. Please contact our sales staff with questions or pricing. Protank & Equipment Copyright © 2019. Need a quote? Send us a message with what you're looking for and we'll be happy to help!